Your rotator cuff is composed of a group of four muscles that run from your scapula (shoulder blade) to your humerus (upper arm bone) that allow for movements of your upper arm. These 4 muscles allow you to lift and rotate your arms. 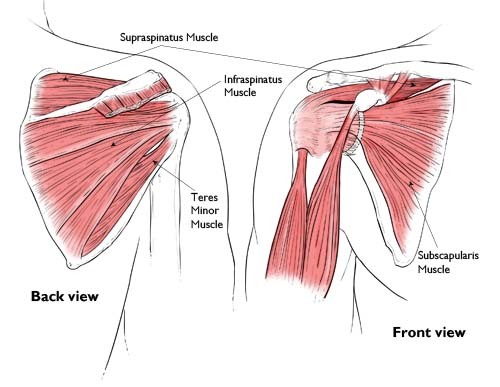 A rotator cuff tear happens when the tendon or muscle of the rotator cuff becomes partially or completely torn and this usually happens through sudden movements of the arm where the load is greater than the muscle is equipped to handle, falls onto the arm, impact to the shoulder, overuse, and natural wear and tear. In Rotator Cuff Tendonitis one or more of the muscles becomes irritated from over use. This can be the result from overuse (not enough rest) or improper biomechanics. Pain, limited movement, swelling, popping, clicking, grinding, tenderness are all warning signals you’re your body that your injury should not be overlooked. These are just signs and symptoms from your body telling you to take a break and get treatment. – Cryotherapy – Ice should be your first form of treatment and you should ice 20 min on and 60 min off (repeat over and over). – Rest – Avoid using your arm till the pain goes away. – Avoid sleeping on your side. – Stretch the 4 muscles of the rotator cuff. – Strengthen the 4 muscles of the rotator cuff.